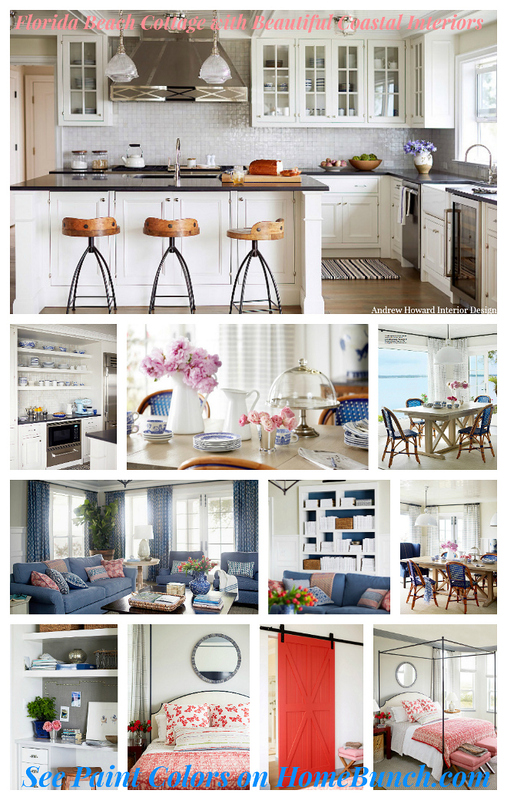 Today’s “Interior Design Ideas” is full of really useful interior tips and beautiful spaces. 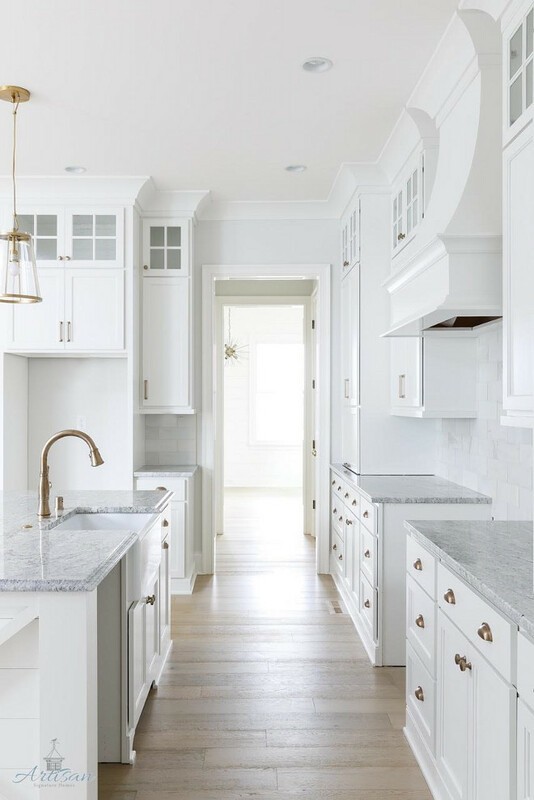 I think you will enjoy the vast collection of kitchens, living rooms, bathrooms and many of them feature paint colors and decor sources. 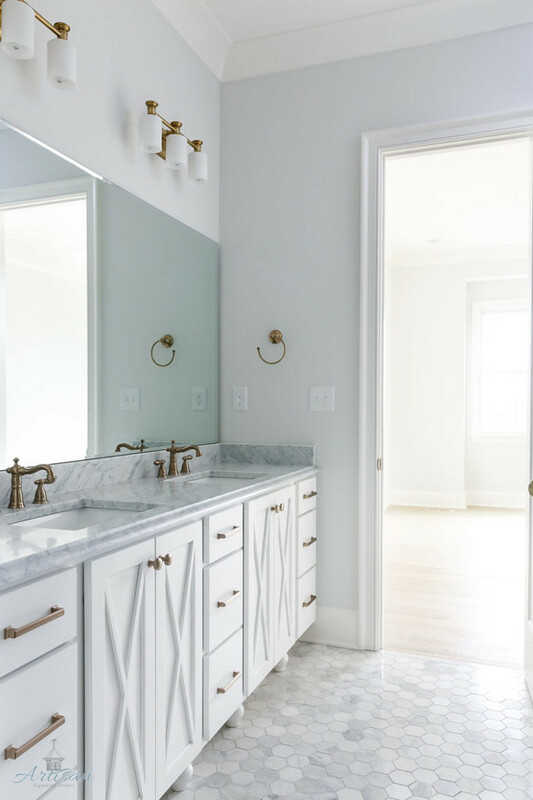 Whether you’re building, renovating or simply want to find new ways to refresh your interiors, this post is filled with ideas! Enjoy! 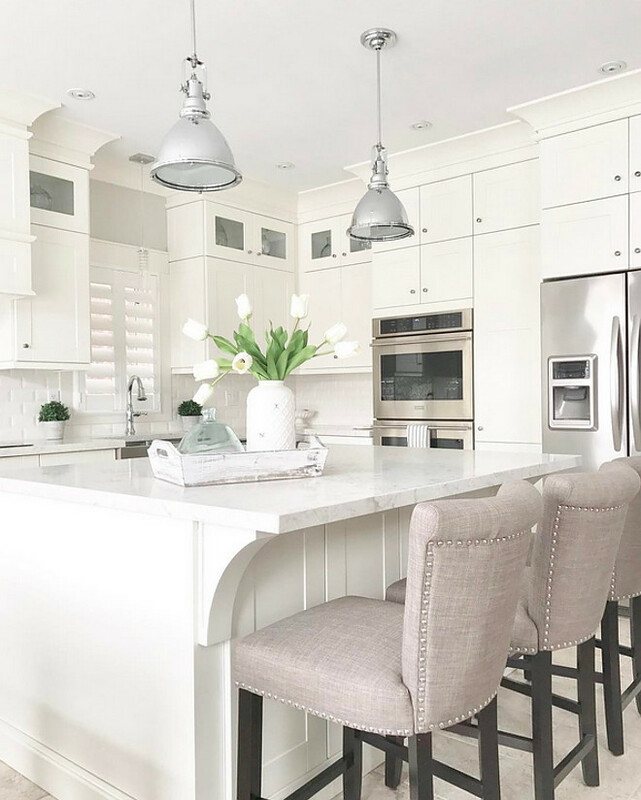 Neutral Benjamin Moore Paint Color: Benjamin Moore Athena 858. Painting is from an artist named Amy Donaldson. 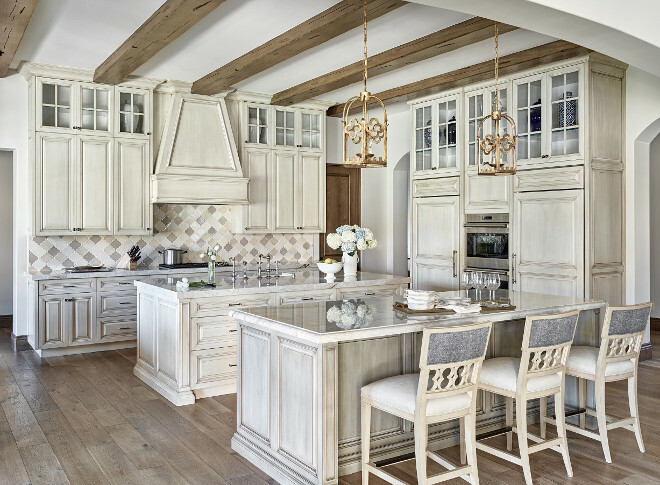 This French kitchen features white oak hardwood floors, two islands, ceiling beams and glazed off-white cabinets. Lighting is from Circa Lighting. Dining room with vaulted herringbone brick ceiling, French doors and custom glass enclosed wine cellar. Breakfast nook with built in cabinets flanking built in bench. 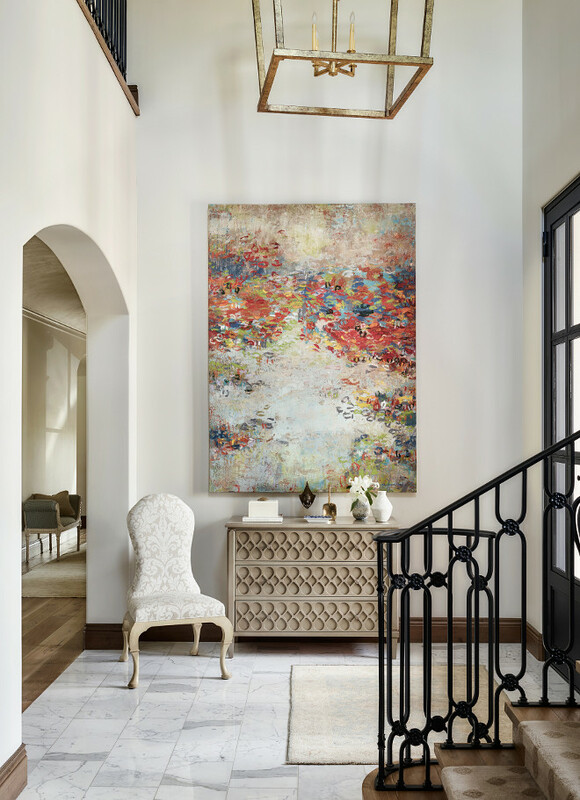 Interior Design by Studio Seiders. 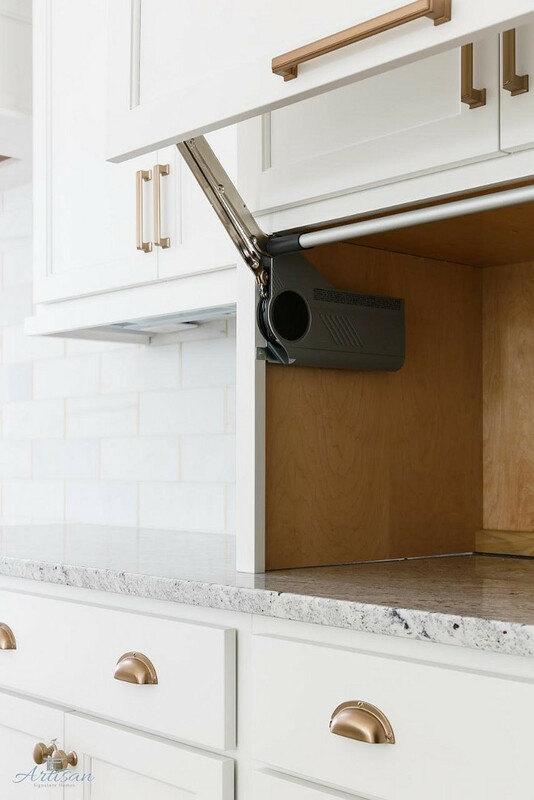 This open concept kitchen features a very practical cabinet layout. 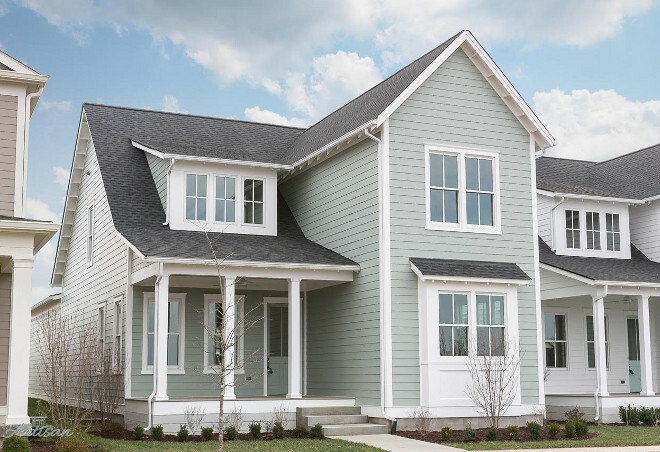 Built by Artisan Signature Homes. 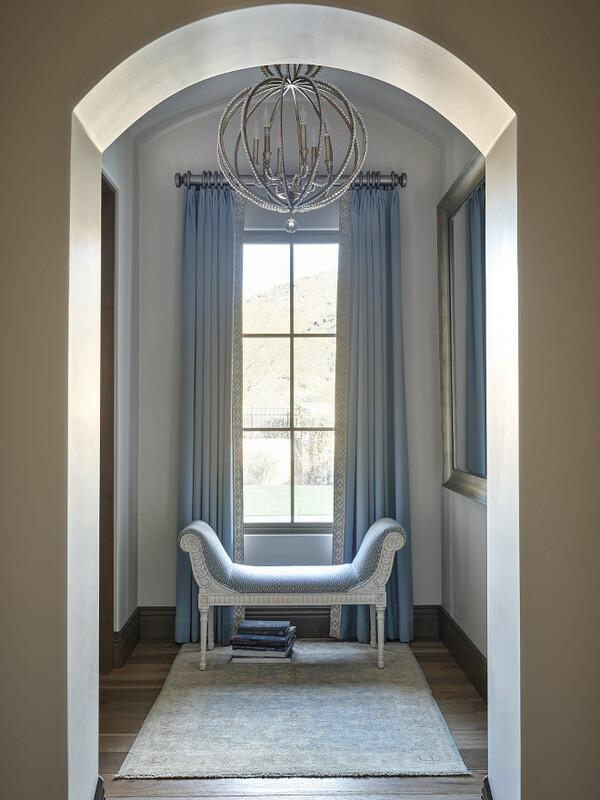 Interior Design by Gretchen Black from Greyhouse Design. 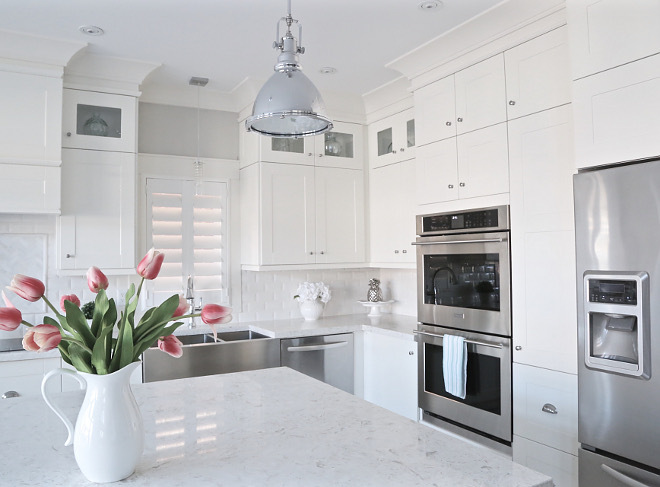 Cabinets are a custom match to Benjamin Moore OC-64 Pure White. 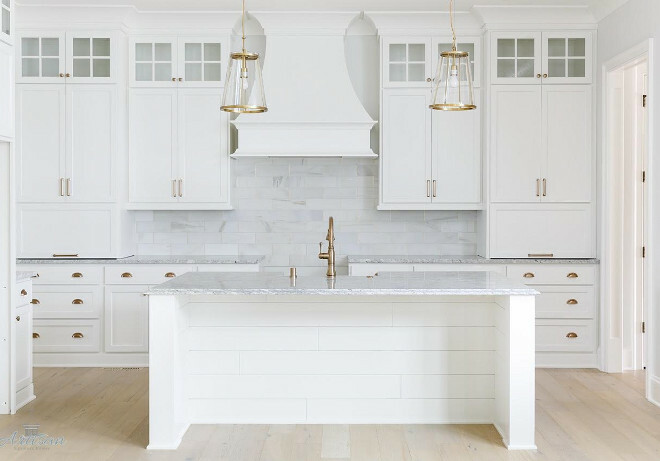 Kitchen island features shiplap paneling. 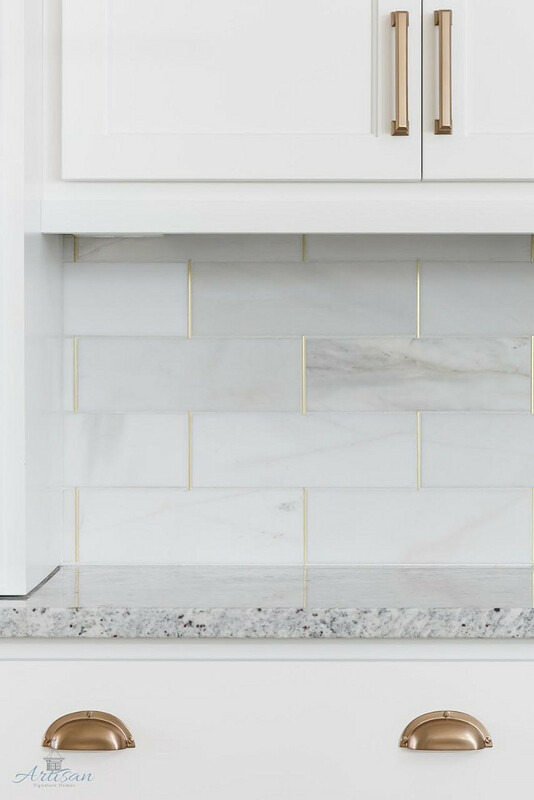 Kitchen backsplash is honed marble by the Tile Shop with brass schluter strips. Amazing! 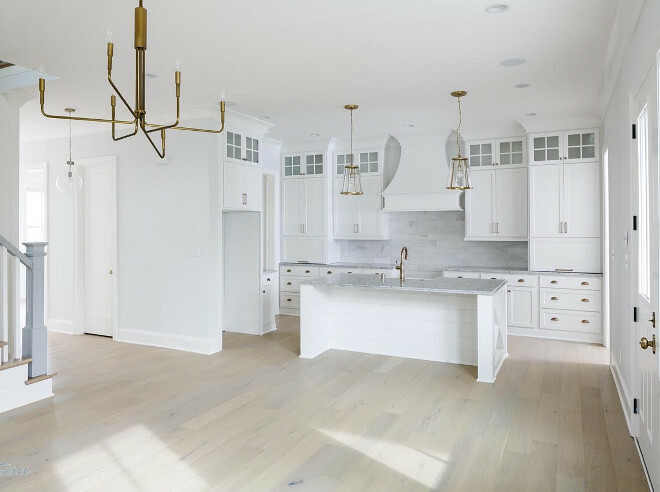 The kitchen hardwood floors are Bella Cera and the color is Maglian. 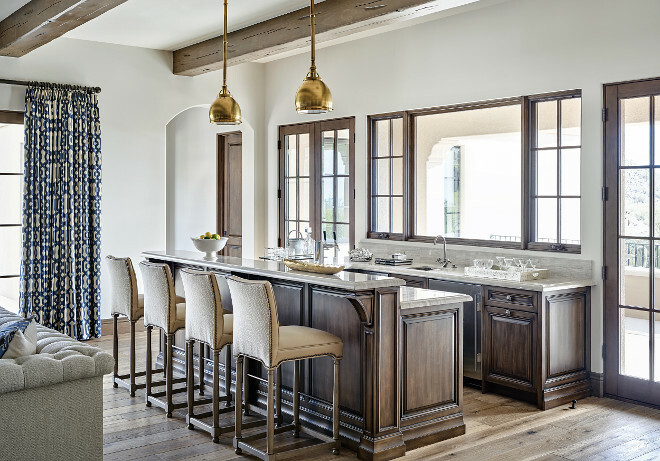 The countertops are a granite called Salinas. 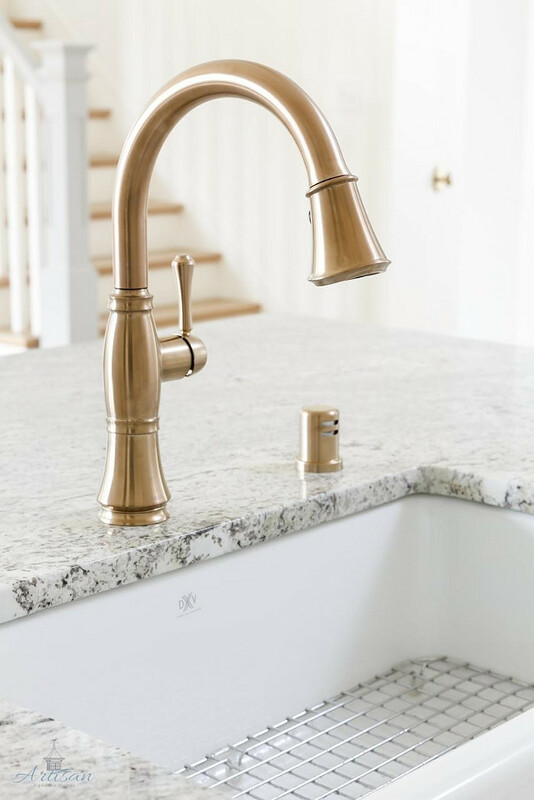 The brass kitchen faucet is by Delta. 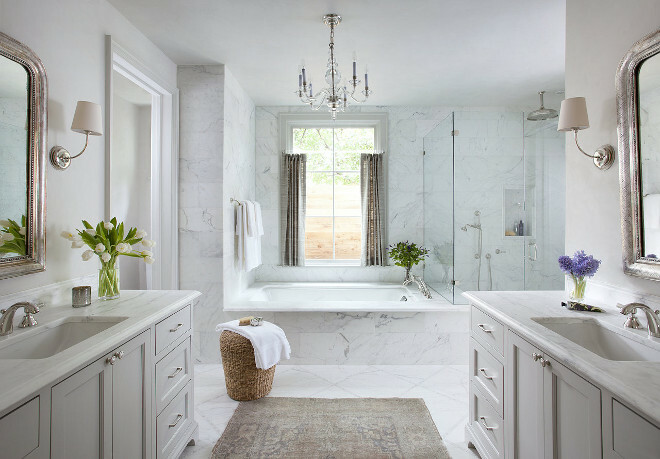 Farmhouse sink is by DXV. Kitchen and family room lighting is from Crate and Barrel. 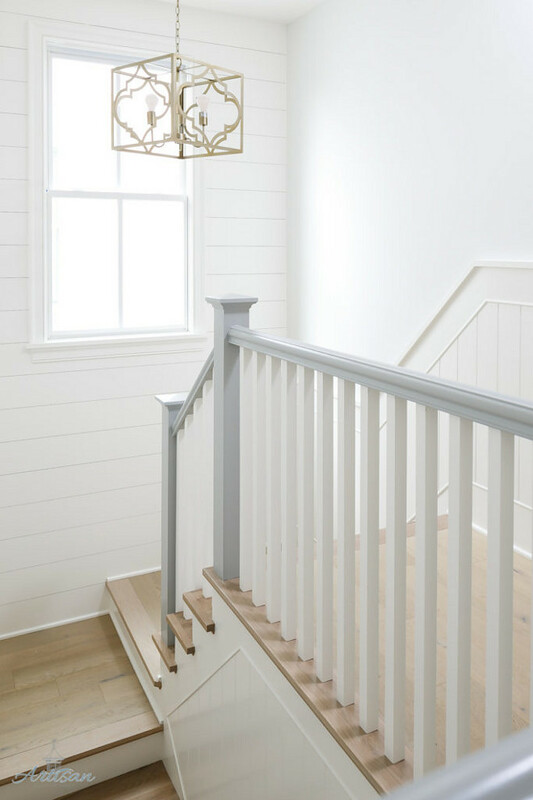 Painted handrails are painted Coventry Grey by Benjamin Moore. 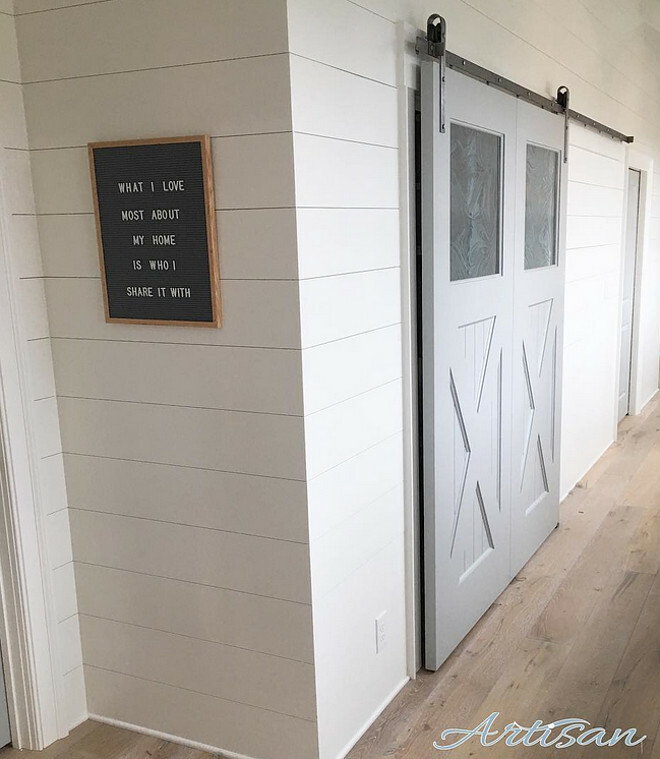 Grey Barn Door Paint Color: Coventry Grey by Benjamin Moore. 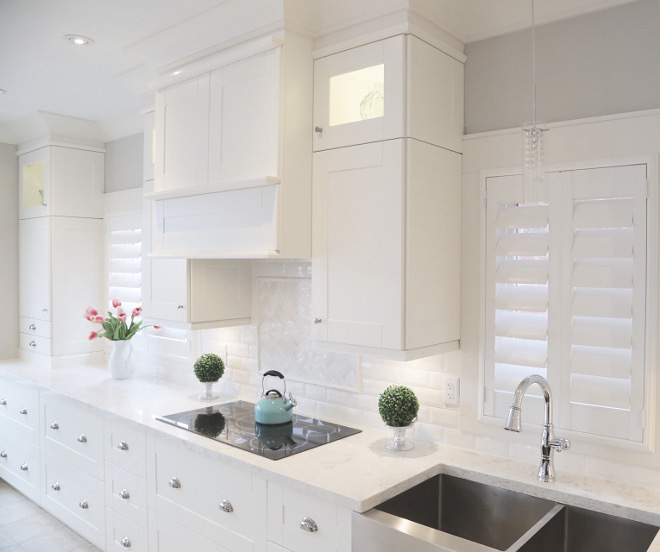 This white kitchen features Ikea cabinetry, Grimslov Doors. 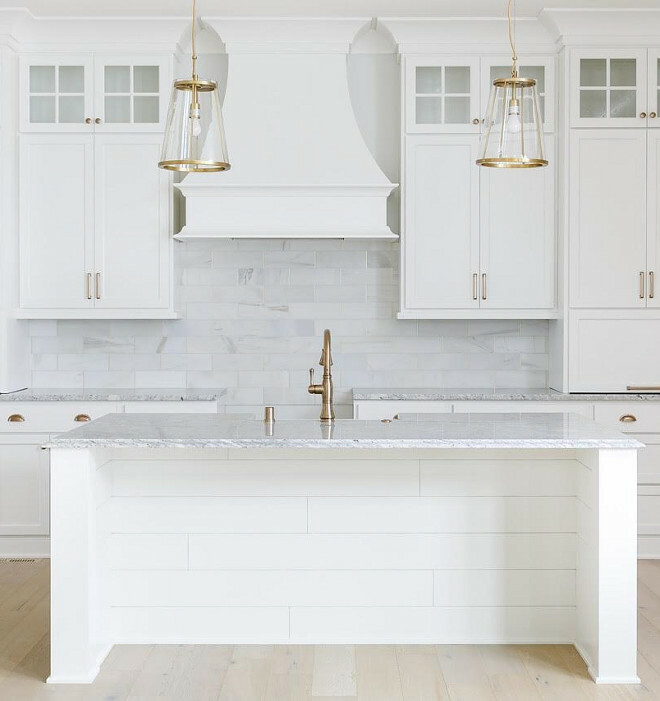 Backsplash is Beveled white subway tile from Lowes. 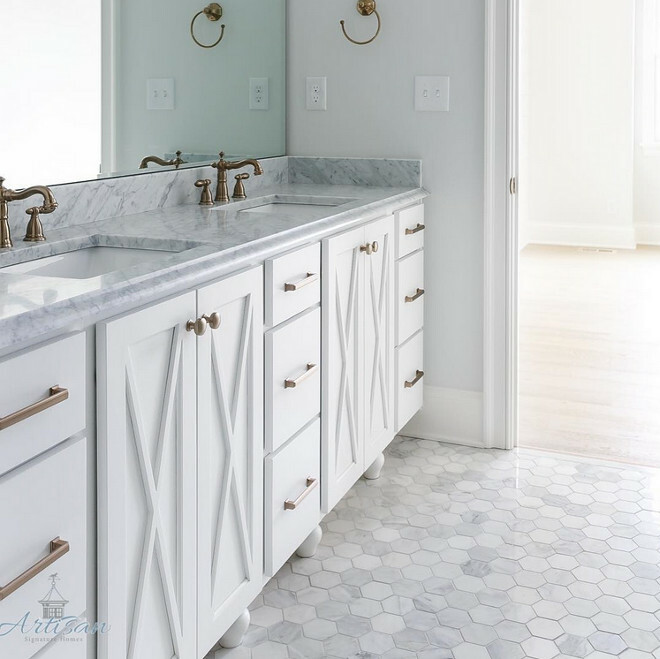 Marble Herringbone insert is also from Lowes. Window Treatments: Vinylbilt 4 1/2” Shutters. 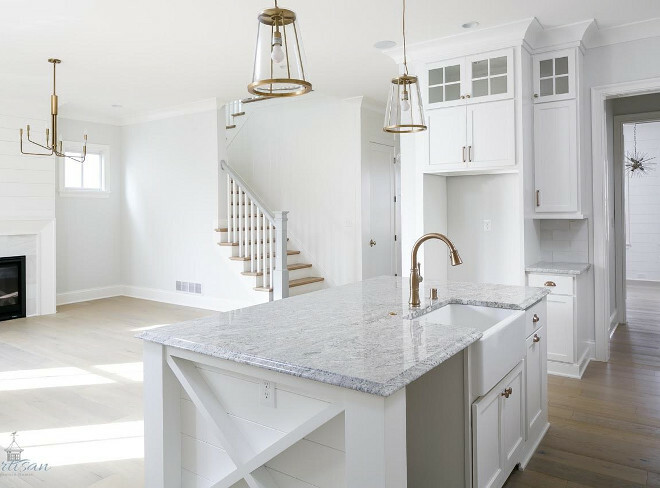 Marble looking quartz countertop is by Kstone in color 9001. 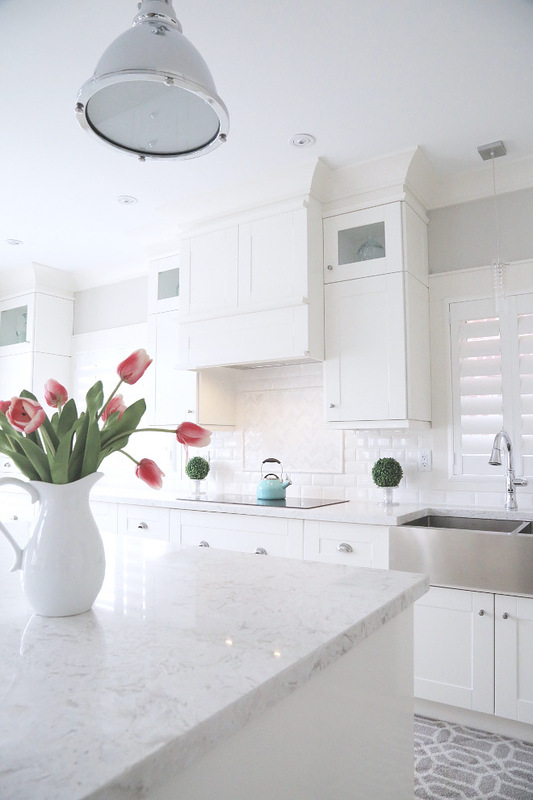 Hardware: Cabinetry knobs and cup hooks are Ikea. Lighting is from Home Sense. 36” induction Cooktop and Double Wall Ovens: Monogram. Grey wall paint color is Sherwin Williams Agreeable Grey. Trim paint color is Benjamin Moore Swiss Coffee. Sink: 36” Stainless steel Farmhouse sink by Kraus. Bar stools and kitchen table chairs are from Target. 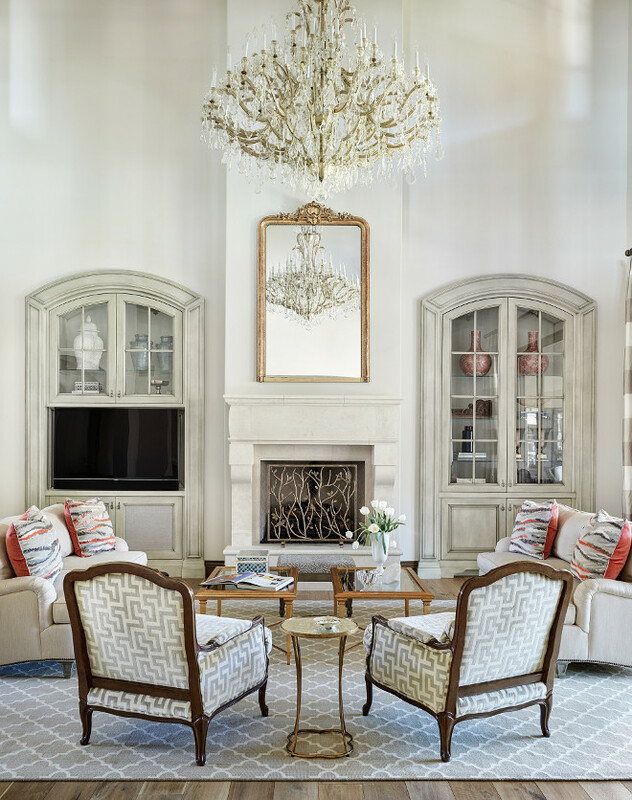 Gorgeous French-inspired living room with stunning crystal chandelier and built-in cabinets flanked by a Limestone fireplace. Paint color is Athena by Benjamin Moore. Family room with white oak French doors. Cabinets and island are stained and glazed. 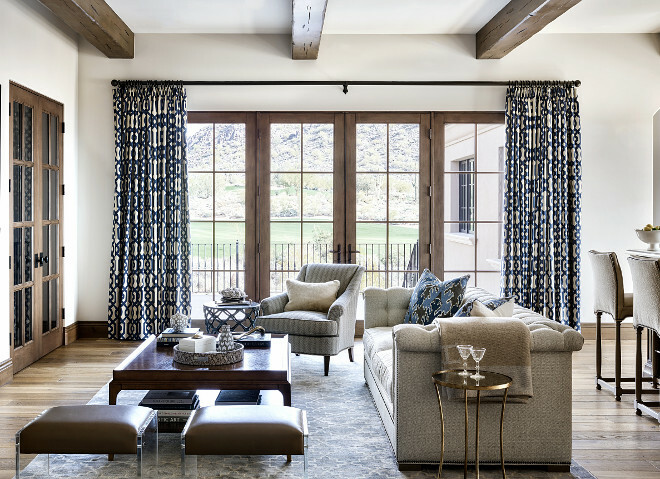 Neutral home office with grasscloth wallpaper and stained coffered ceiling beams. Living room with walk in wine cellar with black steel doors. Gorgeous floor-to-ceiling black steel windows and doors to patio. 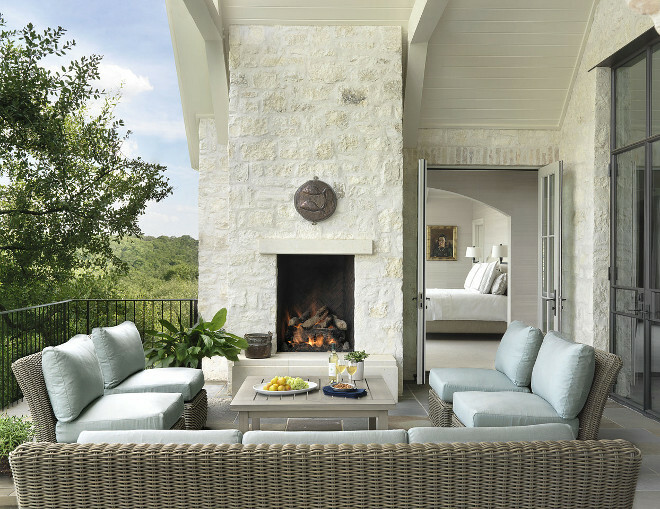 Patio with white stone outdoor fireplace, black steel doors and bluestone floor tile. 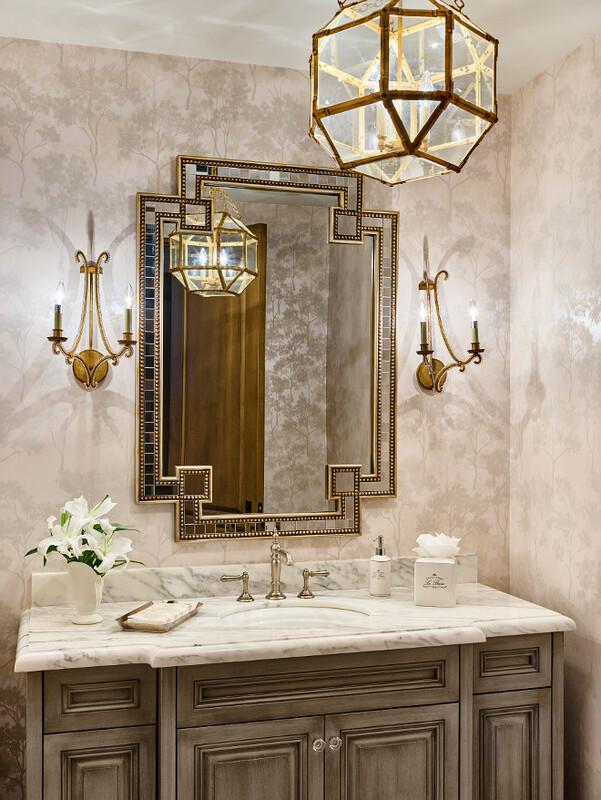 Bathroom lighting is Suzanne Kasler Morris Lantern. The wallpaper is Phillip Jefferies. 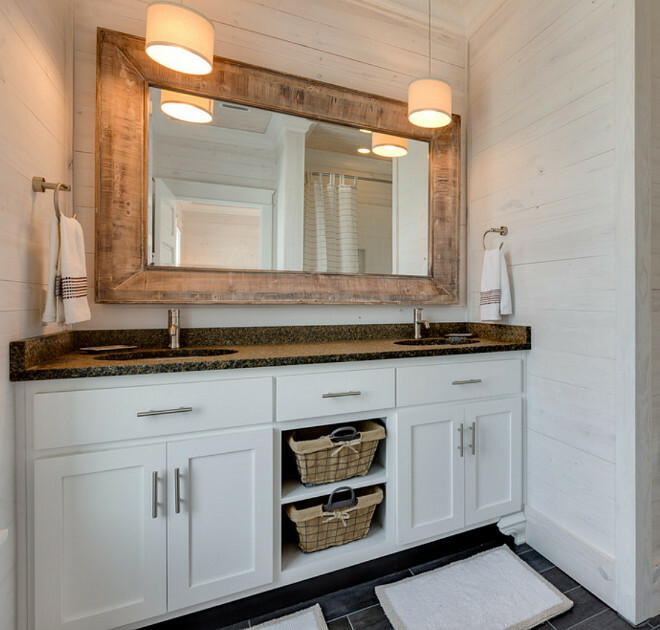 Beach house bathroom features custom vanity with open shelves for baskets and whitewashed pine shiplap walls. Erin E. Kaiser, Kaiser Real Estate Sales, Inc.
Wall cabinet paint color is Sherwin Williams SW 7056 Reserved White. 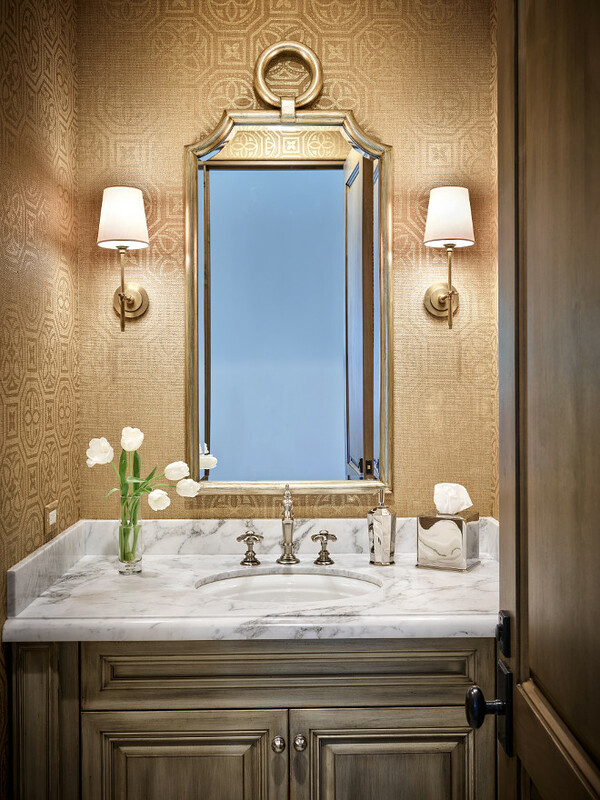 Master bathroom with white cabinet, brass and hex Carrara marble tile on the floor. 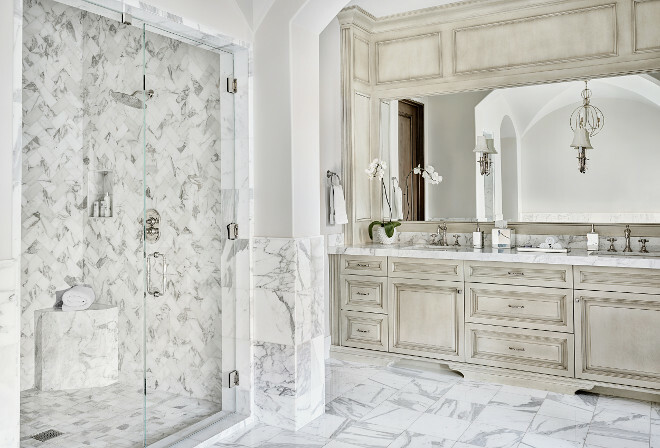 French-inspired bathroom with glazed cabinets. Master bedroom features a grey wallpaper, a French beaded chandelier and a bench at the end of the bed. 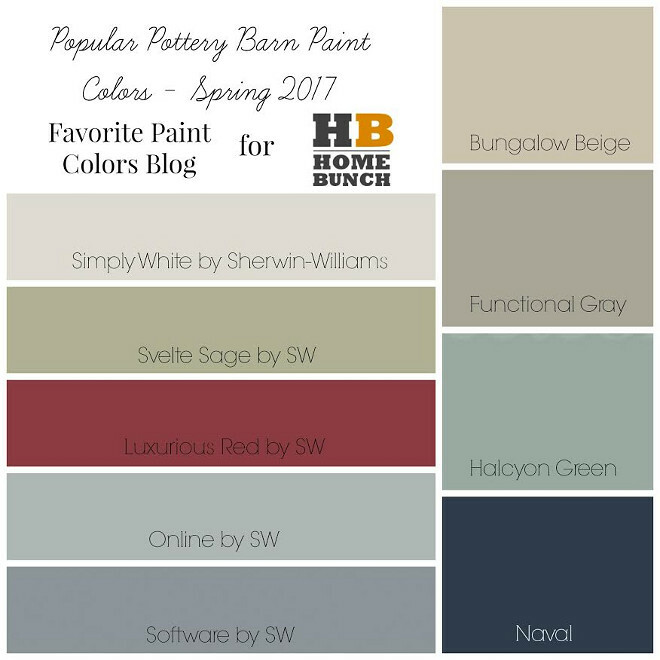 Popular Pottery Barn Paint Colors Spring 2017 – Sherwin Williams: Simply White Sherwin Williams. Svelt Sage Sherwin Williams. Luxurious Red Sherwin Williams. Online Sherwin Williams. Software Sherwin Williams. Bungalow Beige Sherwin Williams. Functional Sherwin Williams. Halcyon Green Sherwin Williams. Naval Sherwin Williams. 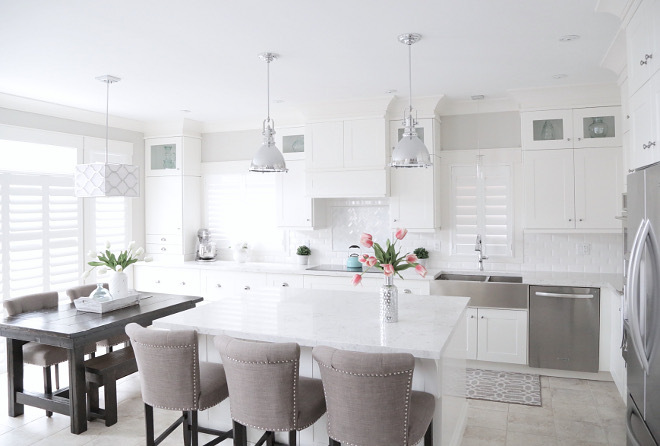 Kristin has a wonderful blog and is a bi-weekly color pallet contributor on Home Bunch. Off-white Painted Brick Paint Color: Farrow and Ball 2009 Clunch. Shutters and Front Door Paint Color: Farrow and Ball Down Pipe. Grey Beach House Exterior Paint Color: Exterior Paint Color: Sherwin Williams SW7649 Silver Plate. Trim Paint Color: Sherwin Williams SW7650 Ellie Gray. Turquoise Door Paint Color: Sherwin Williams Holiday Turquoise SW0075. Exterior siding is James Hardie and is painted Oyster Bay SW 6206 Sherwin Williams. 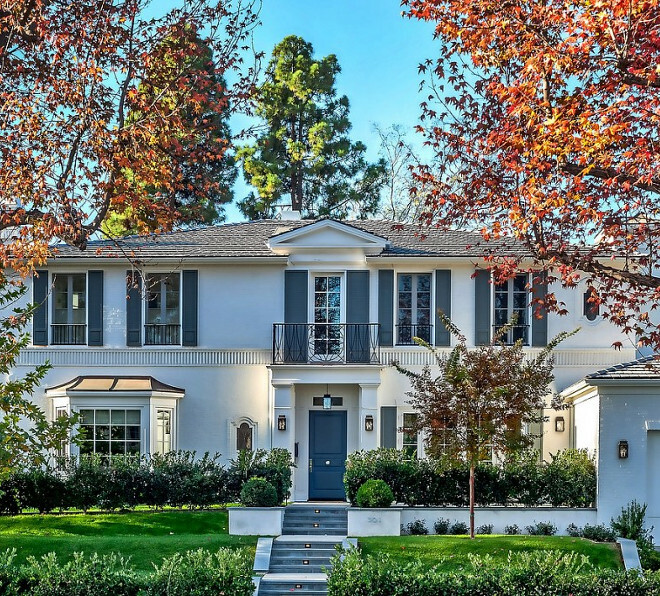 Crisp architectural home with white exterior and black steel windows and black steel doors and slate roof. 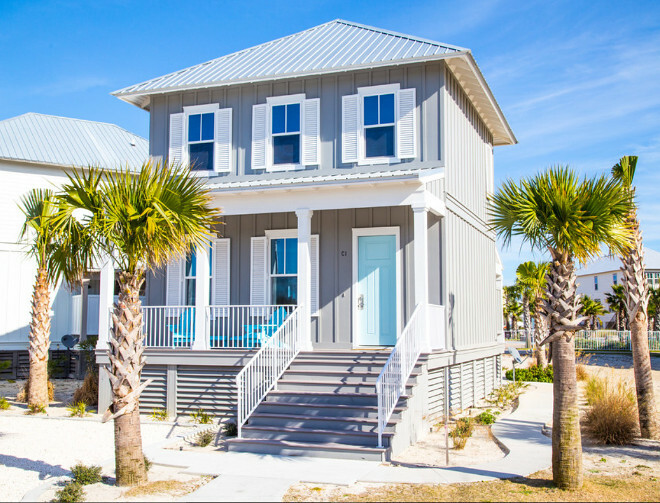 Tuesday: Florida Beach Cottage with Beautiful Coastal Interiors. Wednesday: Turquoise Laundry Room Cabinet Paint Color. Wasn’t it fun to see and learn more about these interiors? I hope you had a good time. 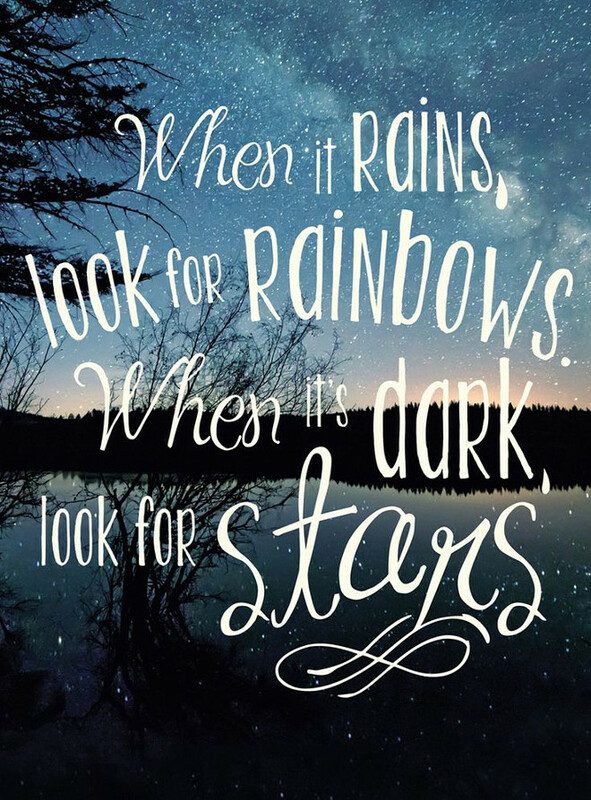 I hope you all have an amazing weekend, filled with laughter, good food, fun people and plenty of Love! Sources: 1st Image: Ryan Street & Associates. Photo by Ryann Ford. 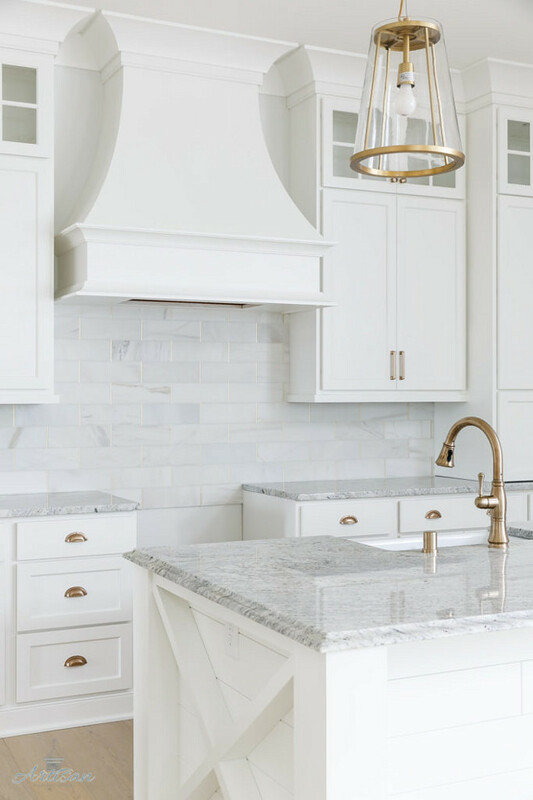 Do you know the details on the brass hardware from the Artisan Signature Home above? Thanks! I have emailed the builder asking this question. I will get back to you as soon I hear from him. Thank you so much, Pamela! What a sweet comment!